Who says breweries don't do public service? The Durango Bootlegger’s Society enjoyed a stellar Pint for Pint blood drive (largest single day blood drive in United Blood Services’ Durango history), which culminated last night with Steamworks brewer Spencer Roper having his hair dyed red. Steamworks rousted the fewest blood donors in the annual competition among the brewers. Please find the press release information attached below. Cheers to Carver Brewing, Durango Brewing, Ska Brewing and Steamworks Brewing!! DURANGO, Colo. – Continuing with its mission of community support, the Durango Bootlegger’s Society, the local consortium of Durango’s four award-winning craft breweries, hosted a record “Pint for Pint” blood drive on Halloween, adding 74 pints of blood to the United Blood Services reserve. Launched in 2003, “Pint for Pint” encourages fans of Durango’s craft brews to donate a pint of blood and receive a voucher for a pint of beer at their favorite local brewery. The breweries – Carver Brewing, Durango Brewing, Ska Brewing and Steamworks Brewing companies – engage in a friendly “competition,” with a representative from the “losing” brewery (the one with the fewest blood donors) required to die their hair red. The Bootleggers originally launched Pint for Pint in response to United Blood Services’ serious need for donors, according to Dave Thibodeau, Ska co-founder. News of the event was picked up by the Associated Press, garnering the Bootleggers national and international attention. Even Jay Leno mentioned Durango and the “beer for blood” drive during one of his opening monologues. The “Pint for Pint” blood drive has since emerged as a “best practice” and been modeled by blood services organizations throughout the country, according to McEachron. The Bootleggers have also led the way in the craft brewing industry for collaborative fundraising by establishing the Durango Bootlegger’s Society Fund under the auspices of the Community Foundation of Southwest Colorado. The fund enables tax-deductible donations. “Collectively we’ve always had a desire to help out the people of our communities who have always supported us,” said McEachron, reminding that the Bootlegger’s mission is to raise the awareness and understanding of craft beer by rallying around the needs of the community. For further information regarding the Community Foundation of Southwest Colorado, or to contribute to the Bootlegger’s Society Fund on-line, visit www.swcommunityfoundation.org. 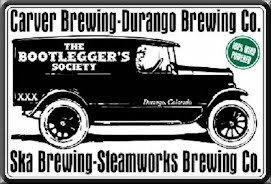 - Bootleggers Society launch Durango Beer Week. - Ska Brewing participates in 2011 GABF Events. - Sky Euphoria Pale Ale review.